Wednesday night we finally got some fresh snow, and since I was miraculously free yesterday afternoon I took advantage of the chance to tramp around in the quiet woods for a couple hours. (And I do mean quiet. Even birds were few and far between, though I flushed several grouse toward the end of my walk. I could hear every gust of wind approaching from far away as the sighing of the trees got closer and closer.) When the sun started peeking out I tried in vain to capture how beautiful the light illuminating the treetops was. I was also on the lookout for animal tracks. 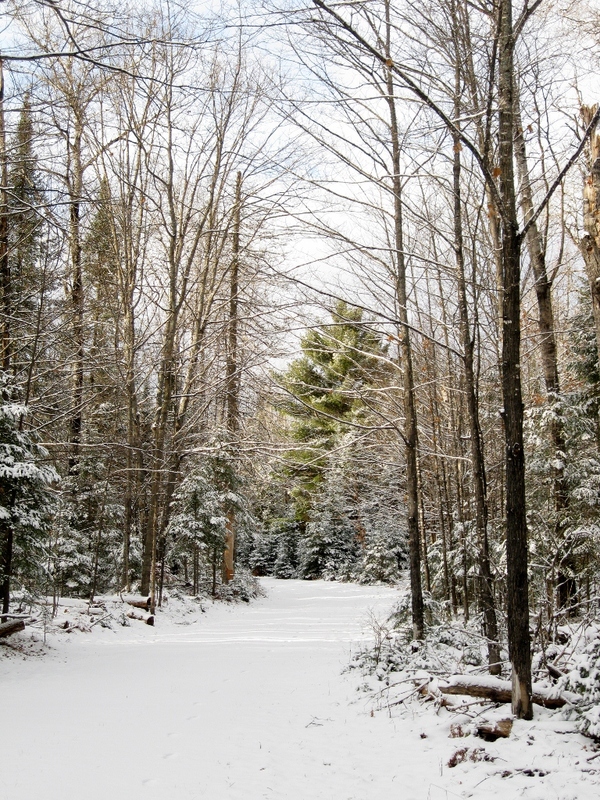 Most of what I saw were from the ubiquitous red squirrels, but crisscrossing the trails in several places were what looked like small tunnels through the snow, about an inch across. 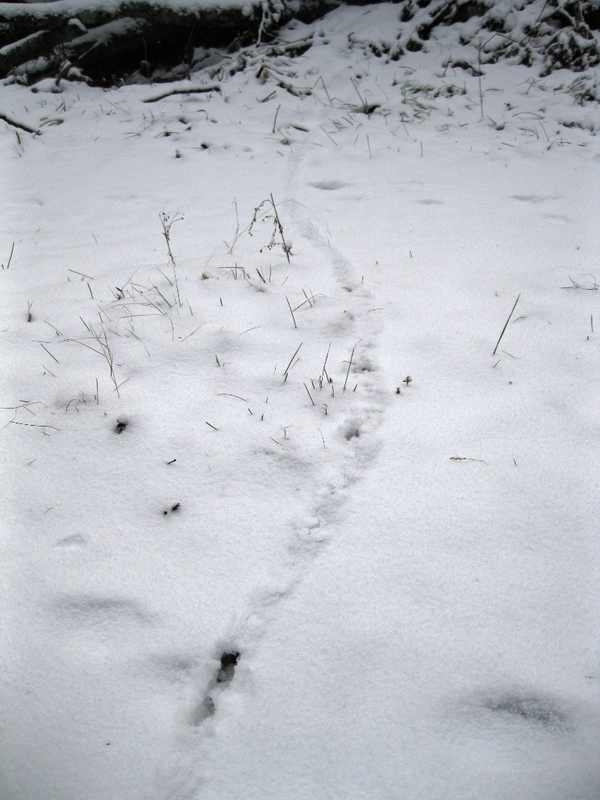 At one point the tunnel-maker had emerged to hop across the surface, leaving tiny tracks. My field guide to animal tracks was frustratingly unhelpful, but I would guess these are the work of the tiny shrews I spotted occasionally on the forest floor early in the fall. (If anyone has any different insights, please share in the comments!) 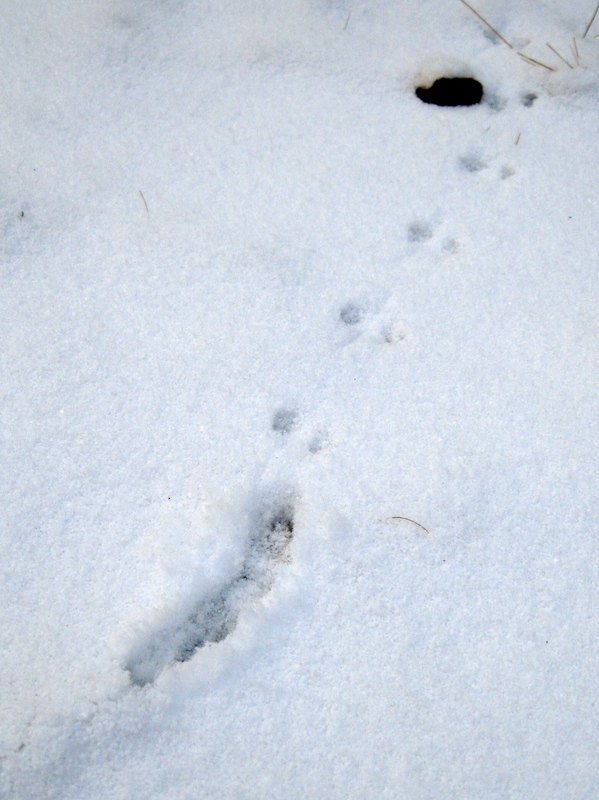 I’m hoping that if I get out in the snow regularly this winter I’ll be able to find more interesting prints – bobcats, bears, wolves, who knows! Lovely pictures-I really enjoy them! “several grouse”? Shouldn’t that be “several grice”? Mouse/mice–Grouse/grice?? Ok, now I understand why you were so anxious for snow! :) That is a beautiful picture, even though I’m sure it was more brilliant in person. Your guess of shrews sounds good to me… they could be good bait for finding fox tracks later. 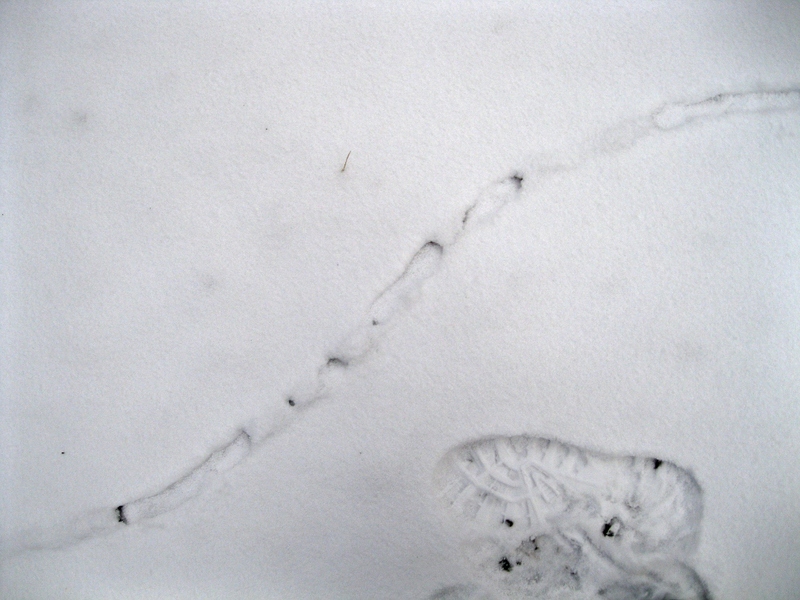 This reminds me of old pictures I took of rabbit tracks, back when I had cross-country skis. Have you considered investing in (or renting) a pair? You can cover a lot more ground that way. Thanks! It did turn out pretty good – it’s easy to take nice photos when the light is that gorgeous. I know that last photo doesn’t have anything to provide scale (note my footprints in the first one), but trust me, the little prints coming out of the tunnel were MUCH too tiny for rabbit tracks. No worries about the skis, the school where I work (and live) has skis and snowshoes we can check out and use anytime. We don’t have enough snow for either yet, but once we do I intend to learn how! Nice snowy woods. Can’t help you with the tracks, but I look forward to your winter adventures. What a beautiful winter scene! I’ve decided I’m ready for snow now. If it must be cold outside, there might as well be snow. I’ve only seen a few flakes so far.